Where is the e in ebooks? Five reasons why ebooks aren’t here yet – or are they? They usually don’t mention the core of ebooks, that the they are digital and therefore have more functionalities than printed books. As I pointed out in my previous post, “Early ebooks and why they failed“, already at the beginning of ebooks 20 years ago the main selling point was the enhanced digital functionality. So why are ebooks today still not using much of all these digital features? One main reason for this is fragmentation. There are numerous user interface designs and no common standard for how these e-features look or work. And conservative book publishers still don’t see the value of user communication, social media communities etc. So most ebooks are just converted print books with no e-functionalities. Well, there are a number of smart e-features already in avying degrees in different ebook applications. For example, see these exemplary video clip examples from the UK publisher Enhanced Editions (scroll down and watch the short videos of each feature). Video inserted into the ebook, either illustrating the content or a short talk by the author. Interactivity such as game functions, move around in photo panoramas, play sound effects or music, quizzes etc. But the above is just the first step, there are many more e’s that should be utilized now that we have the online possibilities to improve the reading experience and business of ebooks! One of the biggest problems in the printed book business is not discussed much, but it is solved by ebooks. Or it could be solved, with a bit of forward thinking! It’s about shelf life, the short longevity of printed books. Since it is so difficult and expensive to print a revised edition of a paper book and re-distribute it to the readers of the original version, this is never done. In contrast to printed books, ebooks can easily be updated by the author. This is of course an enormous advantage for books in the short life-span category described above. This both prolongs the shelf life and increase the value. You can charge more for a business ebook that comes with an offer that it will be updated for free to the buyer. Also, this opens up a direct communication link with the readers, requiring them to register for the updates and also receiving information about the authors next title etc. So why is this business opportunity still not used? But we need much smarter search and catalog systems for ebooks, as well as recommendation engines that work across all the publishers, small and big, globally. Help the readers to drive your sales! Make it very easy to spread the word about an ebook they like. And make it equally easy to receive such a recommendation and act on it by buying the book directly, on the spot, even if you are on a bus. Imagine that you have a number of book shelves in different rooms at home, but you could only put books from one specific publishing house in each book shelf. So to find a book you first have to know the name of the publisher, then in what room and book shelf the book is in. Not very reader-friendly, eh? Well that’s the way it is with ebooks now! 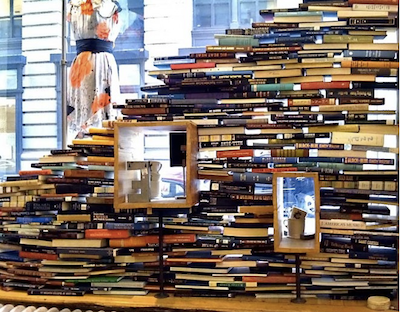 There are numerous methods for organizing the books in your physical book shelf, as described in this funny article in the Guardian, or with this innovative book shelf tree branch. In these book shelves you have a good overview of your books. Compare this with your collection of ebooks: You cannot search for book titles, authors or content, and you cannot sort them with tags for different categories. Your ebook collection is just a database, sitting inside a powerful computer. So technically they should be possible to sort in any way you want! With a physical book shelf you have to choose between sorting the books alphabetically, by the title or the autor, or sort them per category. With a data base you should be able to sort your books in all these ways and more! 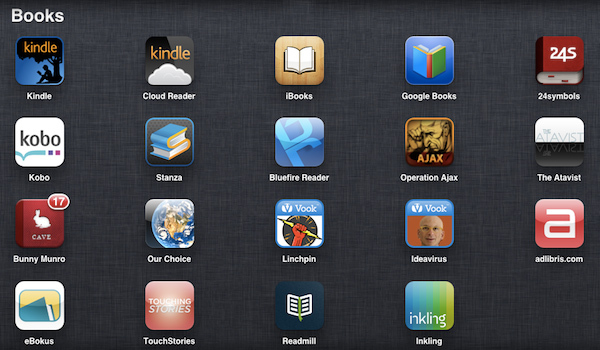 Some of these apps, like Kindle and iBooks, contain multiple books of many kinds that I have purchased from these ebook stores. Others are independent publishers of niche types of ebooks or services for ebook lovers. And some are for individual ebooks. Can you tell the difference? Looking at this collection of icons, how do I find a certain book that I have on my iPad? I can certainly not search for an author’s name or a specific word of phrase that I know is inside one of my ebooks, like I can in every other type of document I have on my computer. So I want a view where I can see and search for all my ebooks, independent of its type or publisher. I usually read several books simultaneously, and sometimes forget what book I was reading. With printed books it is somewhat easier: I see it lying on my bedside table. With ebooks, it is very easy to lose track of what books I have started reading. In my screen shot above from my iPad there is no way I can see what books I have started or finished reading. So how about a clock-type little visual indicator on top of all book icons, showing how much I have read? It would also be nice to have automatic reminders: “Henrik, this is Sunday afternoon and you have 11 unread ebooks and 4 that you have started reading”. And a function (like Runkeeper) where I can automatically post the reading status of my books in my Facebook and Twitter feeds. 1) An unfinished e-book isn’t a constant reminder to finish reading it. I also have this problem. But as I say here, it is possible to create smart reminder systems and social media functions that inspire me to finish my books. I have not seen these functions anywhere yet, here is room for innovation! 3) Notes in the margins help you think. How come the author has missed that this feature has been in ereaders since 1992? Perhaps because it is sometimes not so easy to understand how to use it, we need more intuitive interface designs. 4) E-books are positioned as disposable, but aren’t priced that way. 5) E-books can’t be used for interior design. This is not a problem really, just old-fashioned thinking. Like “kerosene lamps are so beautiful that they will never disappear”. We will continue to buy beautiful coffee-table books to decorate our homes. The ebooks we will use to decorate our social media profiles. This is post #3 in my series on the ebook market and development. Posted on 2011-08-16 2012-08-14 Categories Blog, eBooks, iPadTags eBooks3 Comments on Where is the e in ebooks? Ebooks from 1992: not so different from today! Why did ebooks fail in the 90s? Amazon started the recent ebook growth in late 2007 with the Kindle e-reader. 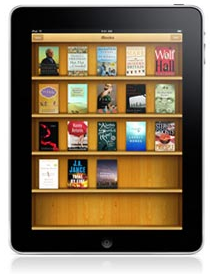 And Apple put another big booster into ebooks in 2010 with the iPad. In February 2011 another milestone was passed, when ebooks became the biggest format of all kinds of books in the US. But nothing is new under the sun, ebooks have been around for a long time, with different names and formats and readers. So why are ebooks taking off now? I see many similarities between today’s disruptive book market and the multimedia business that I worked in during the 90s when my company Ahead Multimedia produced numerous interactive presentations and learning programs on CD-ROM. They had chapters, headlines, body text and illustrations, just like ebooks. we called it “interactive multimedia”. They looked like many of the ebooks you see now, but they also had more interactivity, animations and video than most ebooks have today. Another similarity was the problems of competing and incompatible hardware and software platforms and varying screen sizes. My company thrived because we produced B2B communication for corporate clients so we could control the delivery platforms. 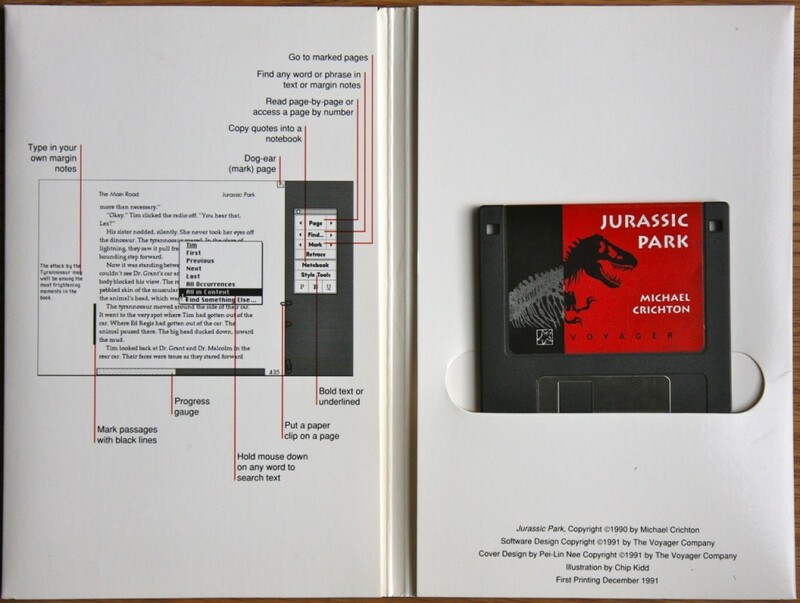 The novel Jurassic Park by Michael Crichton, an ebook on a 1,4 MB floppy disc, introduced in 1992! 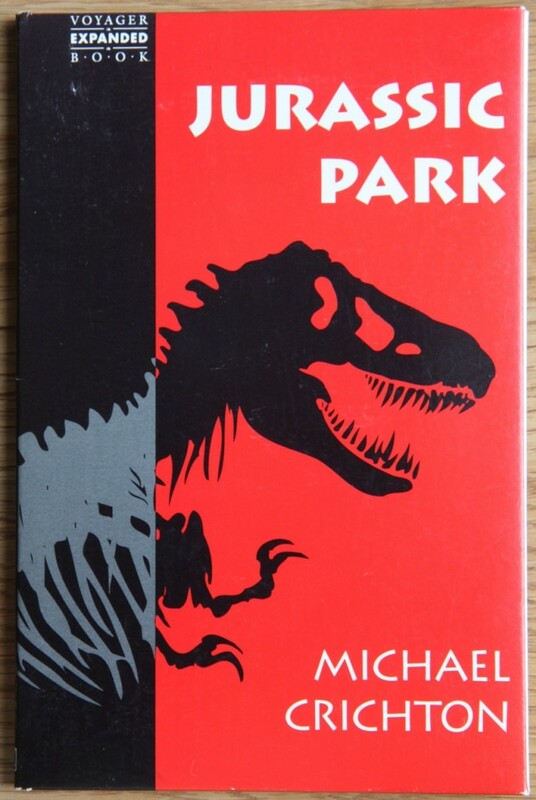 This was the first title in the Expanded Books series produced by the famous Voyager Company, these ebooks were designed for the brand new Apple Powerbook computers. I attended the launch at the MacWorld expo in San Francisco in January 1992. Notice the features such as being able to dog-ear a page or put a paper clip on it, and type in margin notes, search for any words in the book etc. Notice also the absence of all communication tools, remember this was before internet and email so there was no social media or online communities to share your book experiences with! When we founded Readmill there were a few things we were fed up with. One was imitations of wooden bookshelves, the other that everyone was building closed ecosystems where no innovation could thrive. We decided to go the other way. So why did those early ebooks fail? People where not used to consuming media on a computer, and there were no mobiles or tablet computers. There has been a djungle of platforms and formats for ebooks and ereaders introduced in the 90s and 00s, see these enormous charts. Right now it seems that in the US, the Kindle and Nook dedicated ebook readers are leading the pack, while the iPad is totally ruling among the more general-purpose tablet computers. Note that the Kindle ebooks can be read on Kindle ereaders as well as on PCs, Macs, iPads, iPhones, Android mobiles etc, according to Amazon’s vision “buy once, read anywhere”. So the ebook took a long time coming, but it finally looks like the time is ripe now and the ebook market is booming, especially in the US and other English-speaking markets. The ebook market is growing everywhere, but in much varying degrees in different countries, here is a report from spring 2011 on the global market in 2010. We now have computers and mobiles everywhere and wireless connections and much smarter development tools for ebooks than ever before. Most print book publishers are scrambling to get on the ebook bandwagon. It is clear that ebooks are growing everywhere, but there is still lots of confusion on how the market will develop, what kind of ebooks will succeed first etc. But in my view the product itself is still in its infancy when it comes to exploiting all these opportunities and offering the reader a better experience. Already in 1992 the main argument for ebooks was “extended functionality”, smart digital features that increase the reading experience. So where are all these new e-features? This is post #2 in my series on ebook market and development.